1. Born in Lithuania in October 1843, he was given a traditional Talmudic education, and in 1865 started a yeshivah in Vilna. 2. 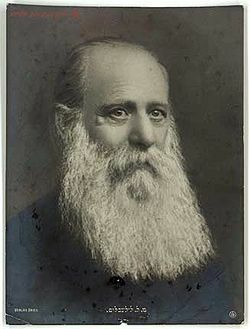 Beginning In 1868, he wrote articles in Hebrew that called for reform in the practice of Judaism that would bring a closer connection between religion and life. He proposed changes in line with the changing conditions of modern life – suspension, for example, of the prohibition against legumes during Passover in the wake of a famine in Lithuania. He argued that the oral law was a human creation that had developed historically and contained internal contradictions. His language was sober, clear and well-reasoned – and it raised a storm of controversy in his orthodox surroundings. In 1869, having been denounced as a freethinker, he moved to Odessa. 3. Now the darling of the movement for reform, he nevertheless felt himself alone in Odessa, where he despaired of the possibility of a compromise between Jewish law and modern life. He read widely among radical writers, including Mapu [see my blog post of February 20]. Compelled by historical explanations for biblical composition, he lost his faith in the divine source of the Torah. 5. By 1873, at the age of 30, he was publishing an autobiography, The Sins of Youth, a narrative that reflected the spiritual and social problems of those who no longer fit into traditional society, but who found only frustration in the culture of the city. 6. In 1878, his parody of the Mishnah was published serially in a radical Hebrew journal. Using the form of the sacred text, he promulgated social, political and economic ideas of social reform. This secularization of holy language had a major influence on his peers. 8. He now believed that the higher Jews rose on the social and economic ladder in their various countries, the more precarious their position would be. Security for Jews could only come in a territory where they could form a majority. Toward this end, in 1883 he founded the Odessa committee of Hovevei Zion and served as its secretary until his death, working alongside Leon Pinsker to organize and assist agricultural settlement while continuing his literary activities. Settlement of the land had become his priority, and he devoted much of his time to it; reform of Judaism took second place. 9. Lilienblum’s writings included poetry, literary criticism, a history of the Hovevei Zion movement, a psychological profile of Moses, two autobiographies (the second was published 1899), and a theatrical piece. Zerubavel, his Yiddish play, was the first modern drama to be produced on the stage in Eretz Yisrael, performed by students in Jerusalem in a Hebrew translation. 10. He died in 1910, having become one of the most important writers produced by the movement for a Jewish national culture. With his deep Jewish learning and his knowledge of European modernism, his writing – both literary and journalistic – argued persuasively for a new Jewish nationalism based on a new Jewish identity. Kfar Mala is named for Lilienblum; an agricultural moshav in the Sharon region north of Petach Tikvah, it is also the birthplace of Ariel Sharon. In Tel Aviv, Lilienblum Street runs between Neve Tzedek and Nahalat Binyamin and is known for its restaurants. The first cinema in Israel was established at 2 Lilienblum. 1. Ben Avigdor is the pen name for Abraham Leib Shalkovich, born near Vilna in 1867. He grew up near Grodno and was educated in Bible and Talmud with the expectation that he’d become a rabbi. Evidently, it didn’t take. 2. In 1889, he moved to Vilna, where he wrote a group of essays on Zionism and his first short story. He joined Bene Mosheh, a Zionist movement and in 1891 was appointed secretary of its Warsaw office. Note that his choice of pen name relates to Bene Mosheh (sons/children of Moses), since “Avigdor” in Talmudic usage refers to Moses. 3. In Warsaw, he began publishing a “library” series in Hebrew – short stories under the name Sifre Agurah (Penny Books) – bringing out 31 numbers in all. His success with these Penny Books prompted a reconsideration among the younger Jewish literati about the titles and distribution of Hebrew texts. 4. Under his leadership, the New Movement was formed by young writers who were rebelling against established themes and writing styles. Every two weeks in the years 1891-93, they put out a 32-page, tightly printed pamphlet that included fiction and nonfiction exploring a variety of issues. 5. Ben Avigdor contributed six novels and novelettes to this effort. Frischmann [see my blog post of February 27] wrote for them, as did Peretz. 6. His next publishing venture was Ahi’asaf, the first publicly funded Jewish printing press. Ben Avigdor was one of the founders of this Hebrew literary venture and its managing editor for three years. 7. In 1895, he sold his shares in Ahi’asaf and founded Tushiyah (Sound Knowledge), a publishing company devoted to the development of modern Hebrew culture. It was the first privately owned, modern secular Jewish printing press, and he served as its editor, producing both literary and scientific works. 8. He also published in the “mother tongue”: Yiddish newspapers; the first edition of Sholem Aleichem’s collected works; and, in the wake of the Kishinev pogrom, a collection edited by Sholem Aleichem to benefit the victims. 9. In 1921 in Carlsbad, having expanded his company’s activities to Palestine and the United States, Abraham Shalkovich, AKA Ben Avigdor, died suddenly at the age of 55. 10. He is not to be confused with Avraham ben Avigdor of Prague, who was longtime chief rabbi and head of Prague’s yeshiva, and who is listed in the Alteneuschul‘s memorial book. In 1541, when Jews were expelled from Prague, he was one of fifteen who were permitted to stay. In response, he wrote an elegy, “Ana Elohe Avraham,” that became part of the prayers said on Yom Kippur. Author of commentary and legal decisions, Avraham ben Avigdor died in 1542. You’ll find Ben Avigdor Street in Tel Aviv just west of Ayalon South and (appropriately) parallel to Tushiya. Ben Avigdor is today a street lined with clubs and dance bars. 1. Nahum Sirkin (or Nachman Syrkin) was born in Mogilev, Russia – now Belarus – in February, 1868. Early on, he was educated by Jewish private tutors; but when his family moved to Minsk in 1884, he attended a Russian high school. 2. He had a philosophical bent and became interested in both Hovevei Zion (a movement to settle Palestine) and socialism. Moving in Russian revolutionary circles, he sought to meld the two, an effort in which he was joined by Ber Berochov [see my blog post of April 10]. He led the Socialist Zionist faction – admittedly, a group with few members – at the First Zionist Congress in 1897. 3. In 1888, after a 3-week imprisonment for his activities, he left Russia and settled in Berlin to pursue his studies in psychology and philosophy. There, he was a founder of the Russian-Jewish Scientific Society; among its members were a number of future Zionist leaders, including Chaim Weizmann. He founded short-lived Yiddish and Hebrew journals and wrote Socialist-Zionist pamphlets which were smuggled into tsarist Russia. 4. “The Jewish Question and the Socialist Jewish State” – originally written in German (1898) – described his concept of Zionism based on cooperative settlement by the Jewish proletariat. In fact, he was the first to propose that immigrants in Palestine form collective settlements. At the Second Zionist Congress, he submitted a resolution for the formation of a Jewish national fund to support settlement. 5. At the congresses, he was known for his provocative speeches, in which he attacked establishment views; he fought with just about everyone about their ideas of Zionism, and his frequent outbursts gave rise to loud protests. He went to the Seventh Zionist Congress in Basel in 1905 as a delegate of the new Zionist Socialist Workers Party. 6. In 1905, no longer welcome in Berlin, he returned to Russia. Then, in 1907, he moved to the United States and became one of the leaders of Poale Zion (the socialist Jewish labor party) in America. He would lead this party until his death. 7. During World War I, Sirkin supported the idea of a Jewish legion to fight with the Allies for the liberation of Palestine from the Ottoman Empire. In 1919, following the war, he served as a member of the American Jewish delegation to the Versailles Peace Conference. 8. In the same year, 1919, the world Poale Zion conference was held it Stockholm. He was given the assignment of visiting Eretz Yisrael as head of a study commission that would develop a plan for kibbutz settlement. He toured the land with other members of the commission and was principal author of the plan, which was later adopted in concept by the Zionist labor movement. 9. Sirkin intended to make aliyah, but he died of a heart attack in New York City in September 1924. His remains were re-interred in Kibbutz Kinneret, along with other founders of labor Zionism, in 1951. You’ll find Sirkin Street in Tel Aviv off Bograshov, between Ben Yehudah and Sholem Aleichem; and in Haifa south of the City Hall. Kfar Sirkin, founded 1933, is located close to Petach Tikvah. Hadassah’s Founder, and – Wow! – so much more. 1. 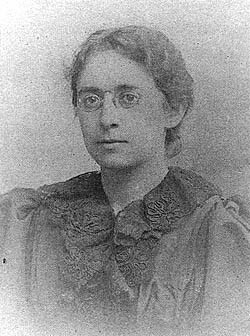 Henrietta Szold was born in Baltimore in December 1860, the daughter of a rabbi, the eldest of eight girls. Among her earliest memories was being perched on her father’s shoulders to catch sight of the funeral cortege of Abraham Lincoln. After graduating at the top of her class from high school in 1877, she taught in both secular and religious schools while attending public lectures at Johns Hopkins. 2. It was she who established the first American night school offering English language instruction and vocational skills to Russian-Jewish and other immigrants in Baltimore. It wasn’t long before 5000 people had attended, and the school became a national model. 3. She began work for the nascent Jewish Publication Society in 1888, an association she maintained for over twenty years. She was the first female editor, one of the nine members of the publications committee and its first executive secretary (1893). Among the many important works that she translated, edited, indexed: translated Simon Dubnow‘s Jewish History, and Nahum Slovschz’s The Renascence of Hebrew Literature; edited the translation of Heinrich Graetz’s History of the Jews (see my blog post of July 17); translated, edited and indexed much of Legends of the Jews, compiled by Louis Ginzberg; and was involved in producing the American Jewish Yearbook from 1898 to 1909. 4. As to her Zionism, in 1896, a month before the publication of Herzl’s Der Judenstaat (see my post of June 26), Szold gave a speech in which she outlined her ideas, including the ingathering of Jews and revival of Jewish culture. In 1898 she was elected to the executive committee of the Federation of American Zionists – its only female member. Later, during World War I, she was the only woman on the Provisional Executive Committee for General Zionist Affairs, headed by Louis Brandeis. 5. She began advanced Jewish studies at the Jewish Theological Seminary in 1902. A rabbinic school, it was for men only, and she was able to pursue her studies only because she managed to obtain permission from Solomon Schechter, its president, in exchange for her promise that she would never seek ordination. 6. In 1909 she visited Palestine for the first time. The trip reinforced her commitment to Zionism and focused her attention on the health, education and welfare of the Yishuv, the Jews of Palestine. In 1910 she became secretary of the board of the Agricultural Experiment Station established by Aaron Aaronsohn (who happens to be one of my characters in Rivka’s War). 7. 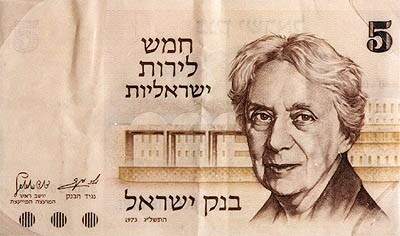 1912: Szold, along with a small group of friends, founded Hadassah. She was to serve as its president until 1926, recruiting American women to upgrade health care in Palestine. Her first project was to start a visiting nurse program in Jerusalem. 8. In 1913, the first Hadassah mission sent two nurses to Palestine to provide pasteurized milk and to eradicate the eye disease trachoma. By 1918, Hadassah sent an entire medical unit of 45 doctors, nurses and sanitary workers. Hadassah was to fund hospitals, a medical school, dental facilities, x-ray clinics, infant welfare stations, and soup kitchens for Jews and Arabs alike. 9. In 1933, Szold made aliyah to Palestine, where she helped run Youth Aliyah, an organization that rescued tens of thousands of Jewish children from Nazi Europe and brought them to settlements in Palestine. 10. During the 1920s and 30s, she had supported Brit Shalom, an organization committed to finding a binational solution to the issue of Jews and Arabs in Palestine. In 1942, she co-founded (with Judah Magnes, Martin Buber, and Ernst Simon) the Ihud political party, dedicated to Arab-Jewish reconciliation and a binational state. 12. She died in Jerusalem at Hadassah Hospital in February 1945, and was buried on the Mount of Olives. In Israel, Mother’s Day is celebrated on 30 Shevat, the day of her death. In Tel Aviv, Henrietta Szold Street runs north-south off the eastern end of Arlosoroff. In Haifa, you’ll find it in the Central Carmel district. Kibbutz Kfar Szold in the upper Galilee is named for her, as is PS134 on East Broadway in Manhattan.